HERE IS A SPECIAL PICTURE WHERE HISTORY IS BEING MADE. NEITHER DOG IS SHOWING VERY WELL IN THIS PICTURE BUT THERE IS A REASON. 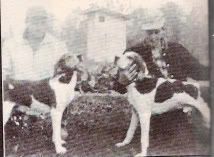 THIS PICTURE WAS TAKEN WHEN BIXLER'S SUPREME SALLY WAS PAYING A VISIT TO SHETLER'S SONNY BOY. THIS IS THE MATING THAT PRODUCED FINLEY RIVER CHIEF. 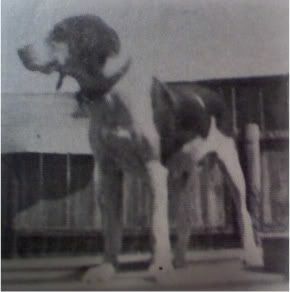 Even though she is best known as the mother of Finley River Chief, Bixler's Supreme Sally was a great coonhound in her own right. She could and did compete with the big boys. Her most famous pup was FINLEY RIVER CHIEF. From that cross there were some sisters to Chief that you will find in some top hounds pedigrees. 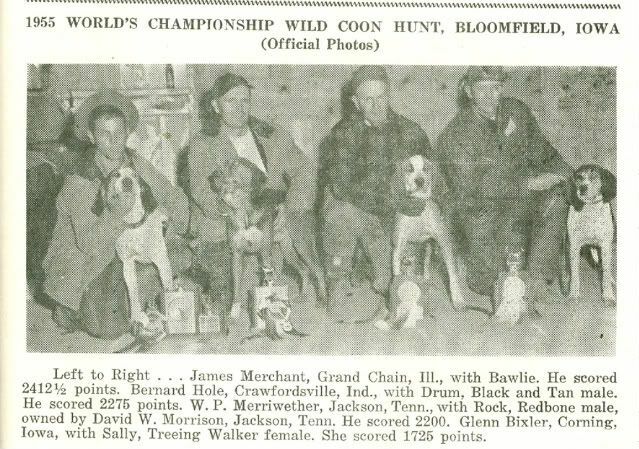 Bixler's Sunny Sally was one of them. She is the mother of Buck Creek Rowdy. Rowdy is the grand sire of Vance's Crowding Billy. Rowdy is also the sire of Procter's Melody Bill. He is the sire of Rutan's Bear Creek Princess, Scott's Lil and Howard's Lu. Princess is the mother of Windham's Drummer Boy and Owen's Hardwood Bozo. Scott's Lil is the mother of Ledbetter's Tennessee Lead. You can go back to more dogs on these three females then what I have listed. Also the dogs listed out of the other dogs Sally was bred to can be found in numerous hounds pedigrees. She was bred to Kentucky Spot that produced Corn Belt Flirt and Corn Belt King and Corn Belt Queen. Flirt is the mother of Corn Belt Sally III who was the mother of Table Rock Flying Hawk. She was bred to Merchant's Bawlie that produced Huisman's Melody Lou and Grand Lake Lady.